Camso-branded CTL sprockets feature OEM-grade hardening, precision and quality inspections. 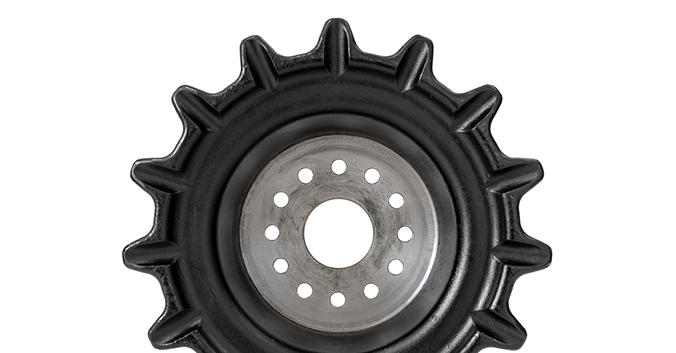 These sprockets come in a range of six sizes for the most popular models of all top track loader brands and are warranted for 1,100 hours. Competitively priced, they're readily available from Camso dealers across North America. As a leading supplier of OEM and aftermarket tracks, Camso has determined that worn sprockets are the major cause of premature track failure. A sprocket, however, can be replaced for a fraction of the cost of a new track. Changing sprockets is a very simple procedure. Fleet owners who change their own tracks, should already have all the skills and tools necessary to change sprockets. Camso recommends teeth sprockets be inspected every time a track is changed. “Check the teeth for the appearance of a 'shark-fin' profile - the thinning and sharpening of the tooth - at the wear tips. This thinning of the metal, along with any broken teeth, will degrade the fit and will result in excessive wear and tear on the track itself. The shark-fin look tells you it's time to replace the sprocket,” says Dembe.